Peonies are a hardy, low-maintenance flower that blooms throughout spring and early summer. A peony clump may survive for up to 50 years, providing good value for many seasons. While the flowers die out before mid-summer, the foliage thrives well into autumn, adding its lush green appearance to your garden. Maintaining the peony plants from the time of blooming until winter dormancy ensures your beds will remain healthy and prolific for many years to come. Deadhead each peony bloom as it fades. Snip off the spent flower 1/4 inch above the top leaf set. This prevents the peony from setting seeds and encourages further blooming. Water peonies weekly the first spring and summer they are planted. Keep soil moist but not soaking wet thereafter. Weed the beds thoroughly to prevent disease and choking of the peony roots. Use caution not to disturb the peony tubers when weeding around them. Apply an organic mulch such as wood chips to keep weed from growing in the bed. Apply low-nitrogen fertilizer after the blooms fade to encourage lush foliage growth, following package instructions. Substitute potash for fertilizer or use in addition to fertilizing. Take care not to get fertilizer directly on leaves or stems. Allow the leaves to die back naturally in the fall. Once leaves have all yellowed, cut the stems down to 3 inches high. 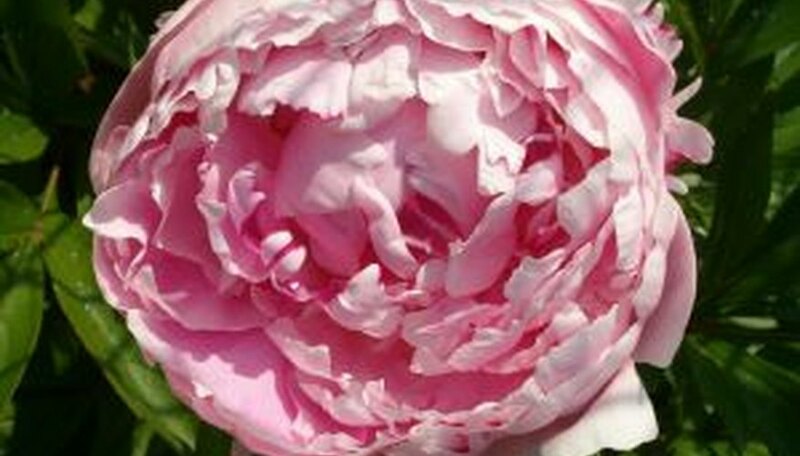 Remove the spent leaves and cut stems from the peony bed along with any weeds or other garden debris around the plants. Dispose of them in the trash; don't put them in the compost pile. Remove any organic mulch added in the spring and destroy it. The mulch carries gray mold which will spread throughout the garden and destroy the peony bed if composted. Replace with a 3-inch-thick covering of straw mulch to maintain moisture and soil temperature for overwintering. Pinch off buds on the sides of the flower stalk to encourage single large blooms or leave intact for many small blooms per stalk. Tie stems to stakes in windy areas to prevent breakage. Avoid dividing peonies until they are 10 to 15 years old.